Rain. High 51F. Winds N at 15 to 25 mph. Chance of rain 80%. Rainfall around a quarter of an inch. Higher wind gusts possible..
Cloudy with rain ending overnight. Low around 40F. Winds NNW at 15 to 25 mph. Chance of rain 80%. In this Sept. 30, 2017 file photo, Bruce Springsteen performs during the closing ceremonies of the Invictus Games in Toronto. His songs will be the focus of today's Geek Speak at Black Hills State University. SPEARFISH | Black Hills State University received an extension of accreditation by the Association to Advance Collegiate Schools of Business, AACSB International. This accreditation is earned by only 5 percent of the world’s business schools that offer degrees at the bachelor level or higher. BHSU President Tom Jackson, Jr., congratulated faculty, staff, students, and all supporters of BHSU on achieving this highest standard. BHSU first received AACSB accreditation in 2014. Once achieved, schools must undergo a continuous improvement review every five years to ensure they are evolving and excelling over time. The AACSB accreditation process includes rigorous self-evaluation and peer-review elements. Greg Farley, dean of the College of Business and Natural Sciences at BHSU, said AACSB accreditation leads to higher levels of student success. Five years after graduation, BHSU business administration graduates report an 85 percent employment rate. BHSU business students work directly with businesses requesting consultation from the School through marketing and retail management classes. BHSU assists students in locating internships, many of which are paid and/or have scholarship opportunities, and lead to full-time job opportunities. An internship while earning her degree at Black Hills State University turned into a full-time, international job for Hannah Downs, Class of 2015. Downs works as the channel manager at B9Creations, a global 3D printer manufacturer based in Rapid City. She recently returned to campus to share her insights with current BHSU students. “When I started at B9Creations I was our sixth employee. Now we have 30 employees and we’re still continuing to grow,” said Downs, who is originally from Madison. B9Creations started as a Kickstarter company and is now a global 3D printer manufacturer. With an ever-increasing catalog of 3D printing solutions, it stands as the market leader in jewelry, prototyping and manufacturing, research, medical devices and model making. As the channel manager, Downs manages B9C’s global channel distribution network. “I work with all of our dealers who sell our products or who represent our products internationally. I help them develop market insights and how to sell their products. A lot of my job is business consulting; I’m helping people to grow their businesses,” said Downs. Dr. Mary Caton-Rosser said she was pleased to see Downs land this job that started with a BHSU internship. Since launching in 2014, B9Creations has employed six BHSU student interns, with Downs being the first. 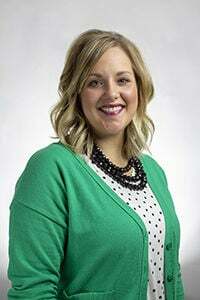 “Her success began at BHSU even before her internship and job. She was a natural at public relations and as a leader in the PR Club on campus,” said Caton-Rosser. Downs agreed, sharing with students in the Managerial Communications class at BHSU that being involved gives you experience, and experience helps prepare you for growth. It was her connections on campus that encouraged Downs to apply for the internship and she says she landed the interview with B9 thanks to her classwork featured on her LinkedIn profile. “My Powtoon video created in Dr. Bobbi Looney’s class is what landed me my internship. I used my Powtoon as a resume to apply for this job,” said Downs. Prof. David Cremean, professor of humanities and English at Black Hills State University, takes us through the meaning behind legendary musician Bruce Springsteen’s music during the next Geek Speak lecture Thursday, Feb. 7, 4 p.m. in Jonas Hall 110. The lecture is free to the public. Cremean is hoping to share his passion and enthusiasm for the arts and specifically, Bruce Springsteen, with the public. Analyzing a few of Springsteen’s ballads, Cremean will take the audience through the real meanings behind the lyrics. “The Ghost of Tom Joad,” “Nebraska,” “Sinaloa Cowboys,” and “Thunder Road” are four ballads Cremean will share. Cremean says there are significant double meanings in Springsteen’s music. Many times the lyrics refer to more than what is simply written. Allusion is everywhere, and according to Cremean it can be found many times through the written or sung words. Springsteen’s music alludes to stories of murder, stereotypes, love and Americana.